Engaging young people in the development of their own community is very close to our hearts and in particular to those in the communities we work in. 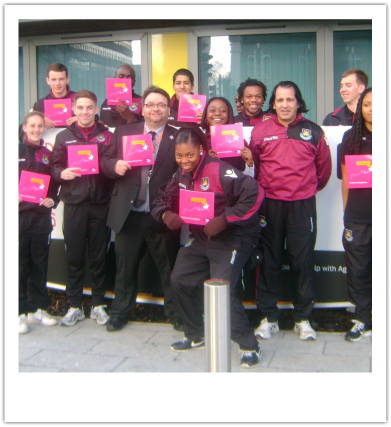 As part of the West Ham United FC's Community Trust Premier League Training & Mentoring Programme, we're working with an amazing group of young East Londoners to help them develop their growing sports coaching skills beyond the improved sports skills they crave for. By tapping into their already built-in entrepreneurial skills, we're embedding enterprising thinking into their learning. For this amazing bunch of young people, now blessed with the ultimate combination of sporting & team skills, a better understanding of how people tick combined with their local knowledge and sponge-like attitude toward learning & personal development, our "coachingEntrepreneurs" programme builds on West Ham United's global brand, East London's 2012 Olympic & Paralympic Games legacy and the belief (with proven results), that it will go some way to conquer the growing level of youth unemployment in East London and the Thames Gateway. WHUFC.....winners of a Premier League Trophy in 2014! The Premier League's Enterprise Programme embeds entrepreneurial thinking into school curriculum. In partnership with the UK Government's Department of Business, Innovation & Skills and Barclays Bank, Premier League Football Clubs (Soccer Clubs if you're reading this in the USA!) 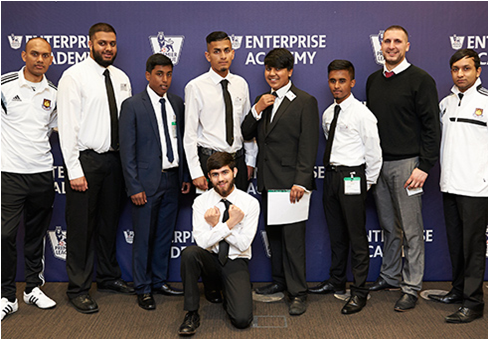 partner with local schools to develop unique business proposals based on the business of football and then pitch these ideas against other Premier League teams to battle it out for a National Competition. We mentored a group of some of the amazing students of one of Tower Hamlets most diversely populated schools, coaching and supporting them with professional presentation skills and in a real business environment. They developed an innovative marketing plan to improve the West Ham Football Clubs brand in the USA and in Africa using social media, new product development and unique partnerships with charities and local communities. This not only impressed the prestigious panel of judges (including the CEO of the Premier League!) that enabled them to win the competition but suitably impressed the marketing team at West Ham to immediately implement some of their ideas for real! Its not everyday you can say West Ham United have won a Premier League Football Trophy......but we can now!